Every winter it is bound to happen. Those sad little glassy eyes wake up and pout “momma…I don’t feel good”. If they don’t feel like eating that is fine by me. Let their bodies use energy to fight the infection instead of digesting food! But they do need to stay hydrated so their organs and immune system can do their job. While mineral rich bone broth is always my first drink offer, even my girls who like bone broth won’t likely sip on it all day. A few years back when my first daughter got her first cold I did a quick freak out at the ingredient list in the Pedialyte isle and decided I would just make my own. A mixture of cleansing lemon and energy giving raw honey was welcomed by my little one at the time. And the sea salt packed a mineral punch that kept her electrolytes in balance while she fought off her first cold. 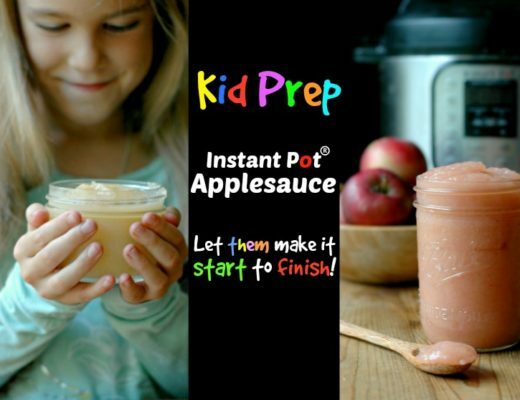 Easy shake it up in the jar prep! In the last 2 years I have nailed down the ingredient amounts I like to use – AND made it an efficient and quick process to make. This momma of 3 doesn’t have much time for playing around with mixing, measuring, and heating. This recipe is literally dump the ingredients in a pint mason jar and give it a shake. Done. This recipe makes a pint mason jar perfectly. My girls are younger and typically won’t drink more than this amount in one day while they are ill. It is a nice amount to make for them to sip on in small amounts during the day. If you have older kids, or will be using it for yourself while ill you can double, triple, or more into a pitcher. When I make it for myself I double it into a quart mason jar. 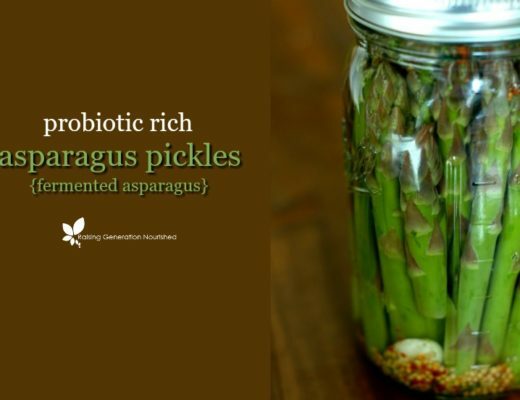 Since most of the immune system resides in the gut, I also like to add probiotics to the jar if I haven’t been able to get them in any other way during the day. 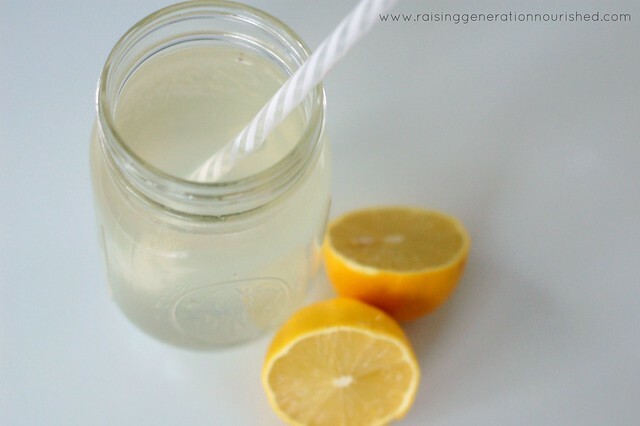 I have one of these super simple lemon juicers – it’s quick enough for busy momma! These elderberry popsicles are another great idea to have on hand during illness. For more info on managing flu symptoms see THIS POST. When the kiddo’s tummies feel like eating solid food again, here is a great Post Tummy Bug Recovery Smoothie to introduce solids back into their gut. Please note this drink is not suitable for babies under the age of 1 considering the raw honey and acidity of the lemons. Babies under 1 should be nursing as much as possible during illness, and if baby is not nursing you can use coconut water to hydrate. When your family isn't feeling well, mix this up to get them on the mend ASAP. Everything into a jar with a lid and shake well to combine. This recipe fits perfect in a pint mason jar. I am feeling thirsty as I read this! I wonder about lemon and the enamel on our teeth?! Hi Sandrine! I drink lemon water most days of the week and have never had a problem with enamel – although I would imagine diet and/or genetics might play a role in that? I LOVE this recipe! So simple and easy to make too. I’ll be making this for my husband often after his training/vigorous work outs. That’s a great idea Emily! I shared this on my Facebook page and it got tons of eyeballs. THANK YOU for this. As I mentioned on FB, I think this is an excellent alternative to the “pediatrician-approved” sitting in plastic for months at a time drinks that are full of unpronounceable ingredients that I don’t think we should be giving to our kids, including petroleum-based food dyes. Love that Jennifer – and yes so true. Thank you for sharing it! Oh yes – perfect – great idea! Hope they feel well soon. I love this alternative to the junk filled stuff at the store. You are such a good mama. Wow, I know a few people sick right now and I am definitely going to pass this on. Thank you! 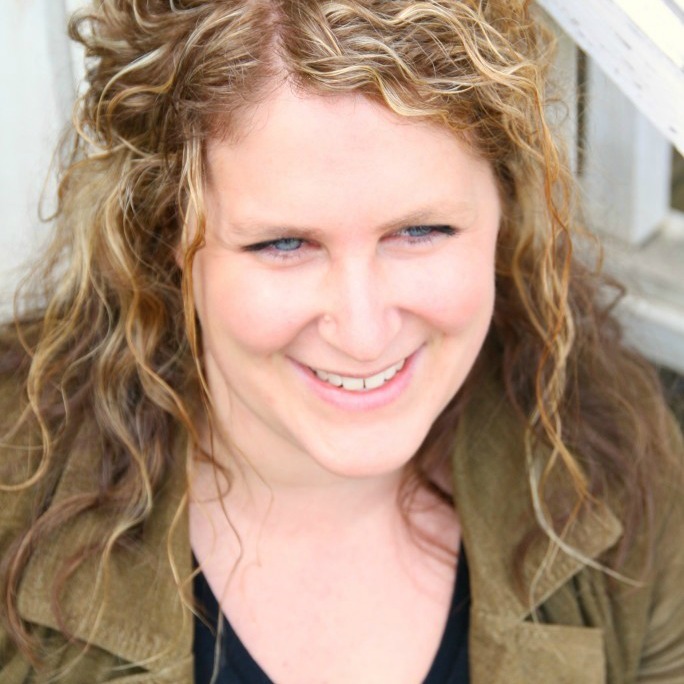 Perfect Jenne – thanks! Hope they feel better soon! A while back I was totally looking for a recipe exactly like this. I was very dehydrated and didn’t want to drink a bunch of Gatorade – this is great thanks! Awesome Tina – thanks for stopping by! I love how simple this is! Pinning it, and will be keeping it in mind. While the electrolytes in this are awesome for those that are sick, etc. it would not be appropriate for chemo patients because honey is NOT pasteurized. Chemo patients immune systems are typically in bad shape during chemotherapy and giving them honey may effect their ability to recover. Possibly this recipe with an alternative sweetener would be more appropriate. Hi Sirena! Thank you for the information! I didn’t make recommendations for chemo patients in this particular post as that is not my specialty. If raw honey is a concern you can use a splash of organic apple juice, pure maple syrup (which has minerals too), or splash of organic fresh squeezed orange juice. Hope that helps! This looks great! I hate all the Gatorade that kids drink for sporting events and to replenish fluids & electrolytes. 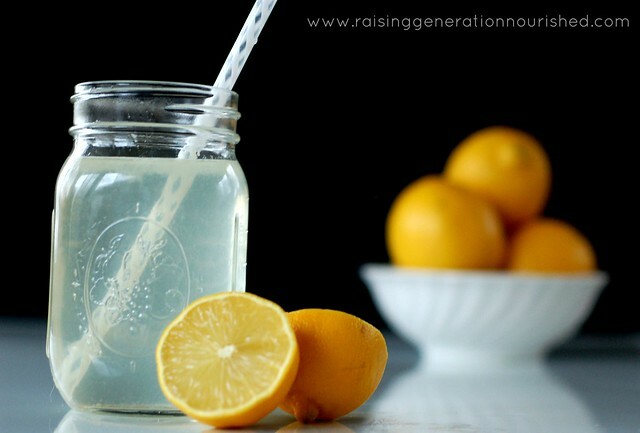 Is the lemon crucial to the electrolytes or could you add/substitute lemon essential oils? I love the detoxifying nature of the lemon essential oils. Hi Lori! If you feel comfortable using the lemon EO in your drink you may do that 🙂 I don’t advocate for ingesting essential oils at this time so I would still recommend the lemon. 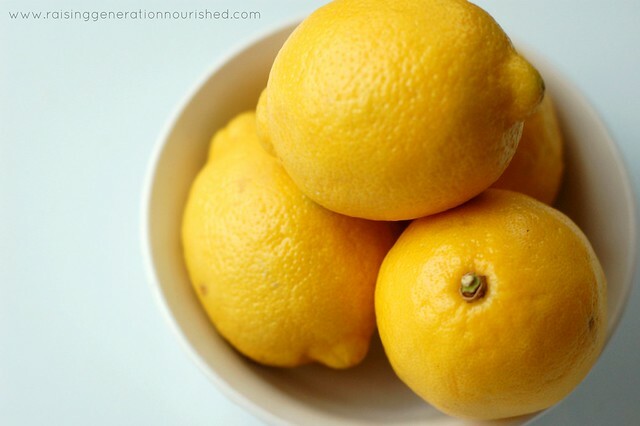 The I like getting the juice squeezed right from the lemon for its detoxing attributes and vitamin C. I hope that helps! Have you used orange in place of lemon? I’m sure it would taste fine but only curious. Hi Angel! Fresh squeezed orange would work fine too if that is what you have. 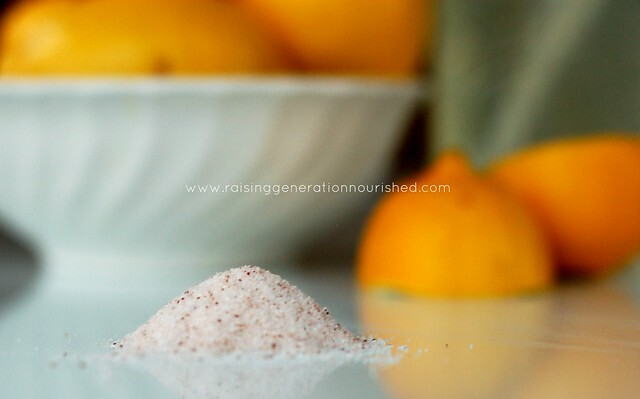 Lemons do have a detoxing attribute along with the vitamin C which is why I prefer the lemon, but if your little one prefers the orange and will drink it better that way do that. Hope that helps! Great drink and taste, really works! Glad it worked for you Chris! Thanks for stopping by for the feedback! I just made this using Stevia in place of honey (that’s what I had on hand). I exercise really hard for 2-3 hours at a time and lose a lot of fluid sweating. I can get bad cramps in all muscle groups in my legs during the night. Although I drink lots of lemon water I have never put salt in it. I hope this works for me! I also heated it up like a tea and it is great tasting on this cold day! Please tell parents not to give children under 12months honey!!!! That’s a big NO NO!! Hi Lynn 🙂 I never said in this post that this drink was appropriate for babies under 1. 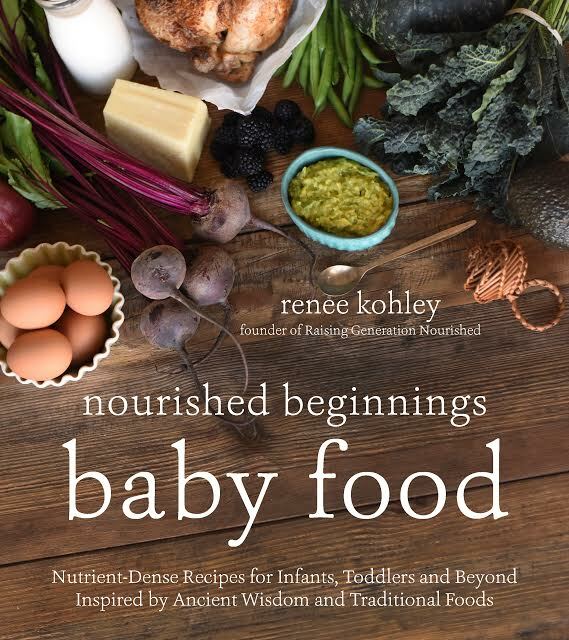 I will be more specific and edit that right now – babies under one ought be either nursing or if they cannot they can drink coconut water with a pinch of sea salt. Hi Rachel! Congratulations on your upcoming arrival! Yes this would be a fantastic drink to keep on hand for labor! would Manuka honey be ok to use? Hi Lorna! Yep! That works great too! Thank you so much for this!! I had made something similar to this a few months ago & had sweetened it with a bit of pure maple syrup. I also added about a Tbsp of ACV (Bragg’s Apple Cider Vinegar). It was very refreshing. Don’t know why I forgot about it— other than the fact that this doozy of a cold I’ve had for 5days (1st in over 2yrs) has muddled my brain!! I actually ended up drinking Gatorade…. blechhhh. OK… thanks for the reminder & recipe for this electrolyte drink!! Question– what do you think of the addition of the ACV?? Love this! 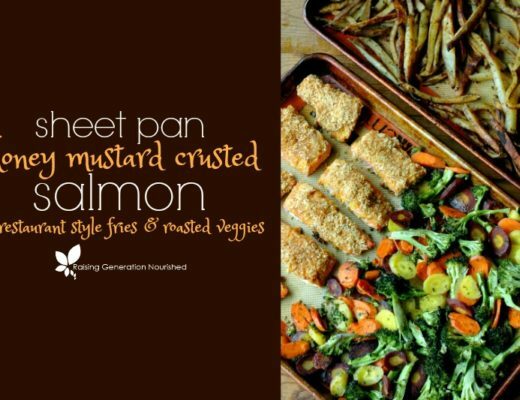 Thaks for sharing it with us on Allergy Free Wednesday, I am featuring your recipe this week! I can catch a cold really fast, sometimes there are months when I have a stuffy nose what results into a headache or a sore throat. If I had some lemons I would make it immediately. We’ve had a morning of sickness in our house and no way to get to the store for pedialyte. Then I remembered seeing this on Allergy Free Wednesday. I just made it and tried it and 7 year old drank it right up! Thanks for helping out in a bind. And so much better than store bought! Hi Peggy! Thank you so much for coming back to let me know! That makes my day to hear! Hope you all are on the mend today! Living so far from any decent place to buy produce in the winter, we don’t have any lemons on hand. Is the lemon juice from concentrate in a bottle effective at all for this type of use? I think if I were in that situation Julia I might just add a splash of 100% juice like apple juice. The lemon juice from concentrate really doesn’t have the same nutritional value from what I understand after it goes through the process to be concentrated. Does that make sense? I regularly deal with dehydration/electrolyte imbalance due to gastro issues, and for the past 24 hours I’ve had miserable time with food poisoning as well. 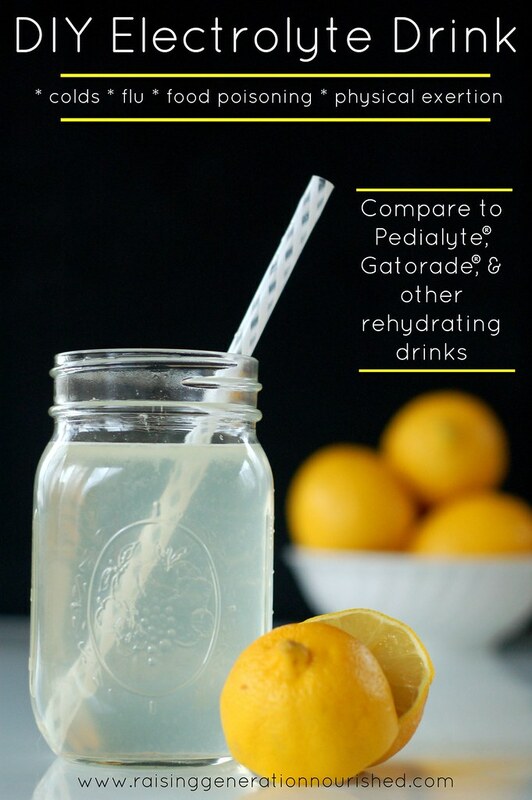 A quick search for “electrolyte re-hydration drink” brought Me to this page, and I said “that sounds like a great recipe!”. It’s similar to one I’ve made for myself before. I used Orange Juice concentrate – homestyle with orange bits still in it, mixed with gatorade, young coconut water, powerade, or the “revive” type of Vitamin water. Then I dumped in a small amount of sea salt and some cane sugar then shook it like crazy. The only additions that could have improved this? Honey, banana puree + water, and some cleansing lemon. Would taking this during excercise not upset your tummy with the vitamin c effect in lemon. I drink lemon water in the morning first thing & it can bring on a toilet visit. Yes it is a fantastic “labor-aide!” Tarah! So precious! Thank you for coming back to let me know Riann! My mother is sick in bed with a migraine, will this recipe help her ailment? It would be a great fluid to try with her for sure! How much and how often should I drink this? Can you use table or kosher salt? That’s all I have. Also if the little one throws this up is it worth it to keep trying? The purpose of the sea salt is for mineral replacement – there isn’t much to table/kosher salt. I wouldn’t give anything to an actively throwing up child until they have been throw up free for 6-8 hours. You could do a tiny sip of this if they are thirsty. Great Hannah! I hope you feel better soon! Thanks for this.. I’m on a low carb diet, and even though I’ve been drinking plenty of water, I started to get really dehydrated. I just made this a half hour ago, and I already feel better. I used what I had on hand which was water, lime juice, Himalayan sea salt and some apple cider vinegar. Great Leah! Thanks for sharing! This is a great recipe but i was still having hydration issyso a friend mentioned adding a Tablespoon of a healthy Gelatin to it and wowee that made all the difference. My body actually holds and absorbes it so im not instantly eliminating after ive drank it. My question is: is honey essential to get the full electrolyte effect? What is honeys role in achieving this electrolyte status? Thanks i know this is an old thread, i hope you are still servicing this. Hi Carrie! The Raw Honey has enzymes that are helpful to the gut, but it also makes the drink more palatable for little ones. The sea salt is going to help with the electrolytes. Hi Shamelle! You can drink it hot or cold! Just don’t heat up the raw honey on the stove – add it to the warmed drink. Question. Is the honey a necessary ingredient for replenishing electrolytes or is it more for taste? There is a purpose for the raw honey in some quick burning energy fuel for sick kids or athletes. Raw honey also has healing enzymes and an abundance of minerals good for all bodies. 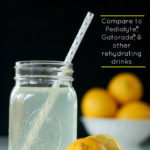 Loved this recipe and a much better alternative to pedialyte for my LO whose had a tummy bug. I added fresh orange, along with the lemon and it was a success! Hi Jen! I’m so glad it was helpful!